Karen - I'm not much on those kinds of endings either, especially in a context such as a Camilleri novel. 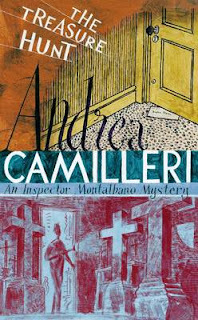 Still, I'm glad you enjoyed a lot of it - I'm such a Camilleri fan! Thanks for the excellent review. I agree with your comment about this book's ending. I, too, was laughing at the banter, but then I got upset at the terrible ending. Unnecessary, in my opinion. I thought there was a turn in the book before this The Dance of the Seagull, in which there was too much blood and gore. And then this one went even further. I hope that Camilleri isn't running out of clever ideas on how to wrap up a story, and turning to violence to do it. Or that his publisher is asking that of him. This book has left me feeling sick and I keep having images of the girl. It is the type of thing that from other, darker literature has led to poor sleep. Usually I cherish Camilleri's Montalbano mysteries for their light nature and wit, along with subtleties of plot and intriguing cases. This is a very morbid scene, one I doubt would be likely to play out in reality, and it is highly disturbing. When I read scenes like that that played out in this novel, I wonder - what state of mind must the author have to even dream of such a scenario in the first instance? There is one particular moment in the book after which I should have stopped reading, as it did perplex me. How could no-one in a public police station have reacted negatively to being mailed a severed lamb's head? To think that is the work of a prankster is absurd.